We are the team to turn to when you need a trusted plumber in Fort Lee, NJ for your unexpected plumbing problem (let’s face it, are plumbing problems ever expected?) But just because we have years of experience and extensive training dealing with pretty much any plumbing issue that comes our way, doesn’t mean we want you to experience those problems. That being said, we’re happy to share with you below some of the most common plumbing problems we get called out for, as well as some tips on how to prevent them so you can reduce your risk of a plumbing emergency. Read on! 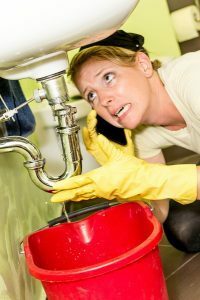 Posted in Plumbing | Comments Off on What Are the Most Common Plumbing Problems? WHAT IF THE PLUMBING LEAKS WHILE YOU’RE AT WORK? It’s important to know where the water shutoff valves are in your home. Should the plumbing system spring a leak, it’s an inconvenience, but you can certainly go to a dedicated shutoff valve (located beside the toilet, sink, or fixture it services) or turn off the water to the whole house to stop the flow of water and then call in a plumber for help. Of course, if a plumbing leak occurs while you’re at work, there’s no way to know about it, and no one home to shut off the water. What can you do in this situation? And is there any way to prevent it from happening? Posted in Plumbing | Comments Off on WHAT IF THE PLUMBING LEAKS WHILE YOU’RE AT WORK? 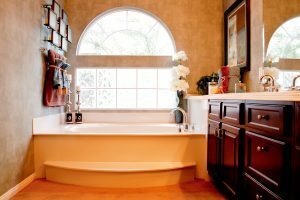 When dealing with plumbing problems in the home, the bathroom is the most common place to have them. It’s the most concentrated point of of the plumbing system in many cases: the spot where three or four outlets at the minimum occupy a very small piece of space. And it sees heavy use every day. It’s the first place you visit when you get up in the morning and the last place you stop at on the way to bed at night. When problems arise there, they can bring your household screeching to a halt very easily. Keeping an eye out for trouble in your bathroom can be a good way to stop problems before they start. Plumbing issues are common in most homes, particularly clogs and leaks, which most homeowners will have to deal with in one way or another. The typical response is to deal with such issues via a store-bought solution, such as a chemical cleanser or perhaps a snake purchased at the local grocery store. In many cases, however, this can be a mistake. Professional plumbing services, even for seemingly minor issues, can take care of the problem much more thoroughly than any store-bought do-it-yourself product. The reasons why are numerous, but there are three you particularly need to pay attention to. Plumbing leaks rank among the most common problems faced by homeowners. Pipes are designed to last a long time, but age and pressure take their toll, and you never know when a leak might spring up. Trained plumbers can correct the problem very quickly in most cases, and you should always let someone with the proper licensing and experience handle plumbing issues of this nature. But the plumber can’t fix the problem unless you realize there’s a problem to be dealt with, and when it comes to plumbing leaks, that can be harder than it seems. DOES YOUR SEWER LINE NEED WORK? The sewer line is the main line connecting your household plumbing to the civic sewer system. 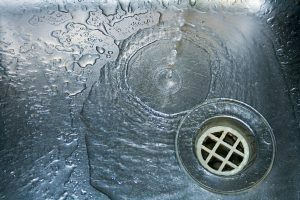 All of the drains from your sinks and tubs lead to it, making it an invaluable conduit for removing waste safely and effectively. The sewer line is usually buried beneath your property, allowing it to do its job safely and efficiently. When trouble arises, however, it can be difficult to spot the problem. 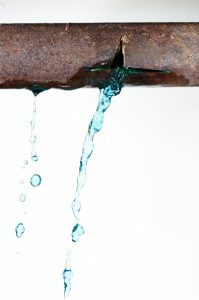 Leaks and clogs often stay hidden until the damage becomes extensive, and reaching the sewer line itself can be a trying task. 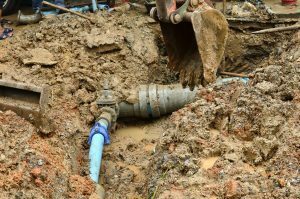 Posted in Plumbing | Comments Off on DOES YOUR SEWER LINE NEED WORK? Few plumbing problems are more troublesome than frozen pipes, which crop up every year in the Dumont, NJ area and can wreak havoc with your household if you let them. Problems with frozen and burst pipes are a common source of repair calls for us in the winter, and while we’re happy to correct the issue once it occurs, we also believe that spotting the signs early — as well as preventing them outright — is greatly preferable to treating the problem once it’s occurred. Plumbing clogs rank among the most common issues homeowners have with their systems. It’s very easy to let the wrong foods slip down the drain, while toiletries, toothpaste and similar materials can gum up your pipes in a very short amount of time. Generally speaking, we urge people to contact a professional plumber to deal with clogs, since store-bought solutions like cleansers or snakes rarely do the job as effectively as they should. 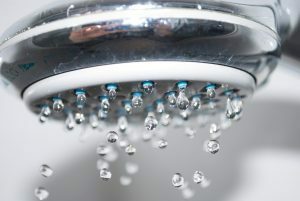 Leaks rank among the most common problems in any plumbing system, and here in Dumont, NJ, we see quite a few of them. They can be repaired fairly quickly, but they can also cause a lot of damage in the interim, especially if they take place in hidden areas like behind the walls where you won’t always notice them. Leaks rarely occur in a vacuum and most come about after a lengthy period of wear and tear on the pipes. By reducing the strain, you can reduce the damage, and thus keep the possibility of leaks to a minimum. Here’s how. The weather’s still reasonably warm here in Englewood, NJ, but fall has officially arrived and winter won’t be too far behind. One of the biggest issues we deal with during the winter months is burst pipes, created when the water freezes and expands inside them until it ruptures the metal of the pipes. Preventing that starts now, when it’s still relatively warm and you have a chance to make additions or changes to help you out. Here’s a list of key steps you can take.